This weeks Illustrated Women in History was submitted by Ramya Ramakrishnan for the Illustrated Women in History exhibition in April 2017 Swindon Central Library. 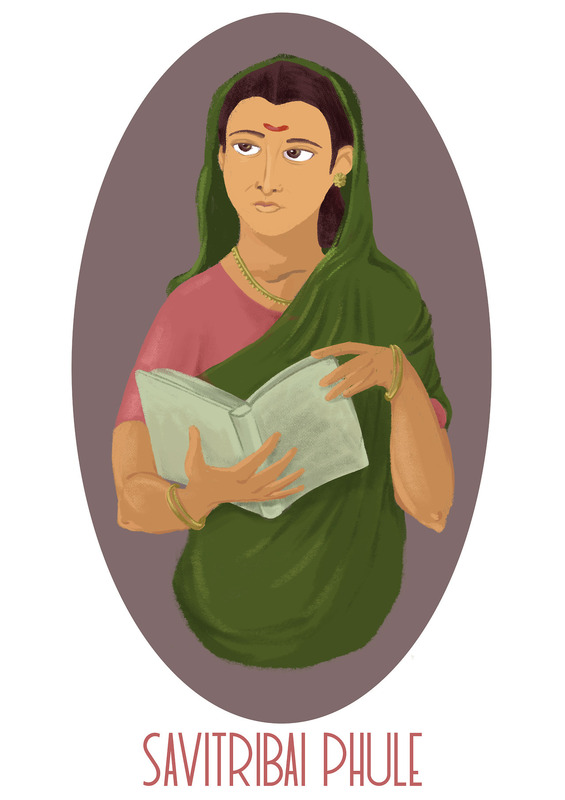 Savitribai was an Indian social reformer, standing up for the injustices against women. She worked along with her husband, Jyotirao Phule. From child marriage, to the caste system, to the oppression of patriarchy, Savitribai was a shining light in the times when women were not even acknowledged to have grievances. With her husband, she founded the first women’s school in Pune in 1848. She was one of India’s first female teachers. Throughout her life she fought against oppression against women. Being a child bride herself, she actively took a stance and fought against child-marriage, the dowry system, championed the education of young girls, promoted inter-caste mingling and gender equality, and even lit the pyre of her husband when he passed away, a task usually performed by the male successor of the deceased. She penned down many famous works, including her letters to her husband, poems and her speeches, all of which were compiled into various books.